Body Talking anounced past week we are part of the Project Tents Haiti Benefit Expo, and we are presenting now our donation item. Its called Miaa and its an exclusive and limited set of 10 poses you can find only at the Expo from May 21st to 30th. Miaa is a fresh, chic and original set, perfect to give a special touch to any casual outfit. “Body Talking” is so happy to present you our first male set, and its a very special set called Storm. This set of 10 poses is perfect for both formal but also a casual look, because its very versatile. Storm has also variations avaliable at the store in single poses to fit different outfits and styles, so you can come and try them! As all our poses, Storm has also smooth transitions making this set perfect for both runway and shots. It is estimated 230,000 people died in the Haiti earthquake. Around a million people remain homeless as a result of the natural disaster. As the rain and hurricane season approach, providing shelter materials to these homeless people is a priority. 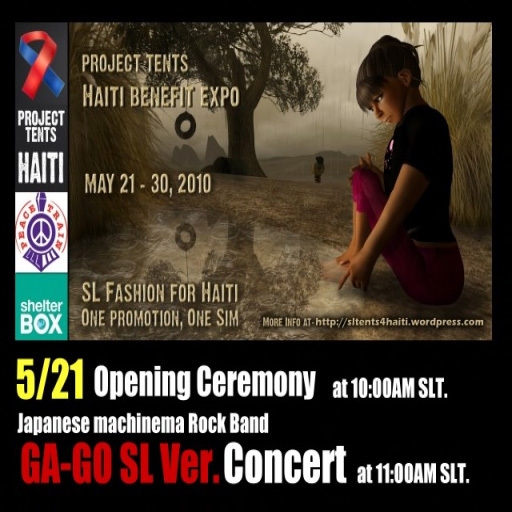 Project Tents is a fundraiser to help raise funds relief efforts in Haiti; and we hope to be a part of the global effort to help the millions of Haitians displaced by the January 12, 2010 disaster. Peace Train is a group in Second Life dedicated to raising awareness of and funds for identified peace-building efforts around the world. Peace Train is the virtual arm of the US Public Charity, the Peace Train Charitable Trust. 100% of donations (collected within Second Life or through our website) are given to the organizations identified. Body Talking is proud to announce that we are part of this charity event and we hope to see you all there and help with what we can do from SL.